Situated in a wonderful green landscape which features lakes and fountains, this prominent center boasts elegant décor and gorgeous views. This center is conveniently located close to Highway 26 and Portland Airport. 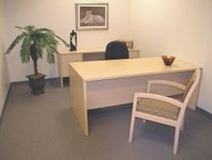 This modernly furnished office space with superior services and amenities is located west of Portland. Facilities include meeting and conference rooms, reception services and the latest IT and network access. The regional transport links are also excellent and provide a wide range of convenient and frequent services in operation throughout the locality and across the area's extensive road and rail networks. This newly-built mixed-use building in downtown Beaverton not only provides fully furnished co-working space and executive suites but also a variety of restaurants including Siam Lotus and Mio Sushi as well as a 24-hour fitness center. Located only half a mile from Beaverton Town Square where there are many fantastic shopping and local restaurant options and is only 10 minutes away from Nike Headquarters. With an ideal location in downtown Beaverton and close to major transport links and shops, this premium serviced office provides a range of workspace solutions ideal for small businesses. Also included is a host of business support services, including meeting rooms and reception.